AP- CINCINNATI (Nov. 16) - Joe Nuxhall, ASA member and the youngest major leaguer at age 15 and later a beloved broadcaster as "the ol' left-hander" in Cincinnati, has died. He was 79. Nuxhall died Thursday night while hospitalized for treatment of pneumonia, the team said. He was awaiting surgery to insert a pacemaker, and had been slowed by a recurrence of cancer since September. "This is a sad day for everyone in the Reds organization," outfielder Ken Griffey Jr. said in a statement. "He did so many great things for so many people. You never heard anyone ever say a bad word about him. We're all going to miss him." Reds owner Bob Castellini said Friday that "Joe exemplified everything baseball's all about, from the mound to the broadcast booth." "...rounding third and heading for home." "Summer nights in Cincinnati will never be the same again without the voice of the ol' left-hander crackling over the airwaves," U.S. Rep. John Boehner of Ohio said in a statement. "To millions, even those who never met Joe in person, his voice was the voice of a good friend." Nuxhall's son, Kim, released a statement thanking the public for the many cards and messages sent to his father. "Dad felt that he truly had three extended families during his career - the great City of Hamilton, where he grew up; Fairfield, where he raised his children; and Cincinnati, where he was able to play and broadcast the great game of baseball with the Cincinnati Reds," Kim Nuxhall said. "We will be eternally grateful to the Cincinnati Reds organization and the fans who provided us with experiences and memories of a lifetime. Dad truly loved you all," he said. Nuxhall's place in baseball lore was secured the moment he stepped onto a big league field. With major league rosters depleted during World War II, he got a chance to pitch in relief for the Reds on June 10, 1944. At 15 years, 10 months, 11 days old, Nuxhall was big for his age. He was 6-foot-3 and his parents let him join the Reds when school let out. Nuxhall spent most of the time watching from the bench, assuming he'd never get into a game. The Reds were trailing the St. Louis Cardinals 13-0 after eight innings when manager Bill McKechnie decided to give the kid a chance. Nuxhall was so rattled when summoned to warm up that he tripped on the top step of the dugout and fell on his face in front of 3,510 fans at Crosley Field. He was terrified when it came time to walk to the mound. "Probably two weeks prior to that, I was pitching against seventh-, eighth- and ninth-graders, kids 13 and 14 years old," he recalled. "All of a sudden, I look up and there's Stan Musial and the likes. It was a very scary situation." Nuxhall walked one and retired two batters before glancing at the on-deck circle and seeing Musial. Nuxhall unraveled - Musial hit a line-drive single, and the Cardinals scored five runs as the young pitcher lost his ability to throw a strike and failed to get another out. In all, he walked five and threw a wild pitch in two-thirds of an inning. "Those people that were at Crosley Field that afternoon probably said, 'Well, that's the last we'll see of that kid,"' Nuxhall said. The Reds sent him to the minors, but eight years later he was back with the Reds. Nuxhall spent 15 of his 16 big league seasons with the Reds, going 135-117 before his retirement in 1966. A year later, Nuxhall started doing radio broadcasts, describing games in a slow-paced, down-home manner that caught on with listeners. Marty Brennaman became the play-by-play announcer in 1974, and the "Marty and Joe" tandem spent the next 28 seasons chatting about their golf games, their gardens and some of the biggest moments in franchise history. 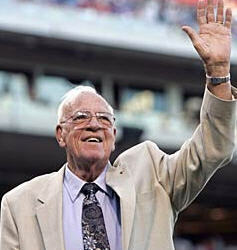 Nuxhall retired as a full-time radio broadcaster after the 2004 season, the 60th anniversary of his historic pitching debut. Since then, he was heavily involved in charity work, especially his scholarship and character education programs. He had surgery for prostate cancer in 1992, followed by a mild heart attack in 2001. The cancer returned last February, when he was preparing for spring training in Sarasota, Fla.
Nuxhall called some games last season even though his left leg was swollen by tumors. He was hospitalized again this week. There will be a private funeral Wednesday.